It is not often that any Company passes such a significant milestone as 150 years of continuous trading, but we are proud to have achieved something in the rubber industry that few manufacturing companies do in any industry, with technologies and markets constantly changing. 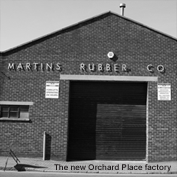 Our origins were in Victorian times, when the exciting properties of natural rubber were being embraced and developed by Joseph Macintosh, resulting in the famous rubber vulcanised canvas material that enabled tarpaulins to be truly waterproof, and the creation of his waterproof clothing generally known as “Mack’s”. 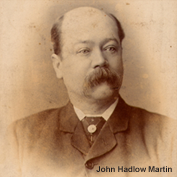 Although John Hadlow Martin founded our company in 1865, his father Robert’s trade was that of “Waterproofer”, so clearly the Martins were already dealing in rubber products well before our company was established. In those days the principle stock in trade was rubber sheeting, hoses, gaskets, surgical and novelty goods and waterproof garments for seafaring – hence our location to this day being adjacent by Southampton Docks. The Martins owned the business until around the time of the First World War, after which it passed through various hands until Mr Bert Campbell joined the business in 1936 having worked for a rival further up Bernard Street, Southampton. Bert relocated the business a short distance into nearby Oxford Street, and continued to progress, although having already traded for over 70 years, Bert retained the Martins’ name for the business he now owned. Bert was quite an innovator, and moved the company further into manufacturing as well as continuing to stock standard products and accessories, and as a result the business played a full part in the support of south coast manufacturing, whether in shipping and naval products, or the aviation industry that was rapidly evolving with companies like Supermarine and A V Roe. World War 2 provided many challenges for the company, and the bombing of the city meant that precious material stocks were stored at Bert Campbell’s house outside the city limits, in the hope that they would be safer there than in the city centre. Wartime demanded a rapid acceleration in the scope and capabilities of the company, with service for urgent requirements the norm. This diverse approach continued through the 1950’s with Bert Campbell expanding the company and building a new factory for the business in Orchard Place, a few yards away from the original premises on Bernard Street. He also acquired the adjoining Atlantic Motor Garage, and turned it into a large rubber moulding shop, with presses he designed and built himself. Mr Brian Hooper joined the company in 1956 having married Bert’s elder daughter Pauline, and Brian’s qualification and skills as a marine engineer added significantly to the expertise of Martin’s; some of the products he developed for the Defence and Nuclear industries are still being manufactured here today. 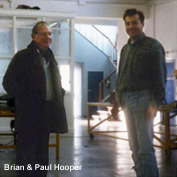 Through the 1960’s and the tough economic climate of the 1970’s the company successfully traded through every recession while continuing whenever possible to invest and innovate, and it was in the 1980’s, with first Paul, then Adam Hooper joining the business, that new technologies arrived. The traditional rubber industry skills of moulding, toolmaking, gasket cutting and stockholding activities were complemented by investment in leading edge CNC rubber & plastics machining, primarily aimed at hydraulic & pneumatic seal manufacture, but rapidly developing into bespoke machining of plastic products. 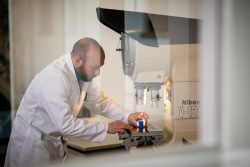 Computerisation followed in the 1990’s with the company investing in writing its own software to service orders, and embracing the internet age very early on, as well as bringing in CAD/CAM facilities in the Toolroom. Responding to the dynamics of the marketplace had always been a strength of the company, and the rapid onset of globalisation in the latter years of the 20th century saw probably the biggest shift in our business processes and facilities, as the company continued to respond to customer needs, further developing its capability with class leading skills and facilities. So having arrived at 2015, an astonishing 150 years since John Hadlow Martin started the company, and in many senses if Mr Martin walked around the factory today, he would recognise much about our current moulding and fabricating activities, despite the advent of fascinating new grades of rubber with properties he could only have dreamt about. Whilst materials and machinery have of course evolved hugely, the basic process of vulcanising rubber would still be recognisable to him, since after all, the basic chemistry of curing natural rubber has not changed in the interim, with advances principally being the introduction of new cure systems and synthetic polymers. However, he would be astonished by our current capability to design and program mould tools on 3D CAD systems and then machine the required parts in 5 axes, and the virtually instantaneous communication world of the internet would surely be a miracle when viewed from a Victorian perspective. Whilst we are of course proud to celebrate our heritage, remaining mindful of the lessons learned and skills acquired over the last century and a half, we are also very clearly focused on the future, with a strong vision of what the company should look like by the year 2025. There are new processes to investigate and commission to further enhance our product range and capability, and we implemented a class leading new ERP system in 2015. Having developed our own software for many years, we built on this knowledge and capability to install a future-proof system that enables us to control and plan the business far more effectively, and further enhance our ability to respond to ever more demanding customer requirements. So, moving into the next 150 years, we pay tribute to the many staff, customers and suppliers who have been part of our journey to this point, but unequivocally look forward to the future with confidence and anticipation. 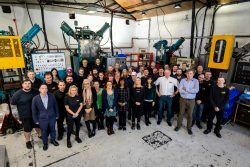 We have a strong and competent team that will take Martin’s Rubber securely into the future, responding and adapting to change as we always have done, and seeking out new opportunities for the long term, continuing to develop our expertise in rubber and deliver valuable, innovative solutions for our customers in the new millennium.